Depth Chart: Where Are They Now? A lot of noteworthy players and coaches have made moves since DLP and ESPN dropped crews on four college campuses just last Fall. Here’s a rundown of some of the more high profile transitions. 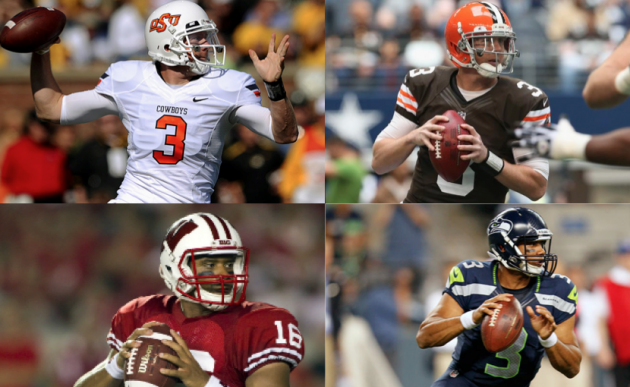 Russell Wilson and Brandon Weeden have traded in their Wisconsin and Oklahoma State spots for starting jobs (since week 1) on the Seahawks and Browns respectively. While these two don’t get the same level of attention that rookie duo RGIII and Andrew Luck receive they have exceeded first year expectations. Collectively with Ryan Tannehill and even Eagles QB Nick Foles this draft class has prompted a lot of discussion about the new trend of starting rookie quarterbacks and actually expecting them to win right away. Our analysis: Sometimes it works, sometimes it sort of works, and sometimes it doesn’t work. This was evident even last season when rookies Cam Newton, Christian Ponder, and Blaine Gabbert had varying degrees of success. On the coaching front Depth Chart focused on the Head Coaches and Offensive Coordinators at the four schools featured in the series. Here’s a snapshot of where they where then and where they are now. All of the offensive coordinators featured in the series accepted their first head coaching jobs within 14 months of Depth Chart airing. Gus Malzahn actually accepted his first two head coaching jobs (Arkansas State & Auburn) during that span.